"Would you rather your child was smart or good?" Talk With Your Kids: Ethics has over 100 conversational and interactive questions for parents to discuss with their children to help decipher their child's stance on ethics, and hopefully sharpen the `right values'. Academic achievement is not the only important aspect of raising children. Michael says that parents also need to think consciously as to how we develop the next generation to be ethical thinkers and decent members of society. Talk With Your Kids asks universal questions perfectly pitched to 10 to 15 year olds. From Cyber-bullying, politics, terrorism, environment to crime and animal rights, every question that you have ever been asked is answered. Parents of varying opinions can choose a topic and lead the charge in a conversation that will engage, inspire and even divide their children. Ethics is written with the intention to raise more questions rather than answer them, drawing kids into an area of thinking that gets progressively trickier and murkier promoting deeper thinking. New York publishing house Black Dog & Leventhal published and distributed a US version of the book America wide, where the topic of ethics is at the forefront of every conversation. Featured as Augusts' Indie Choice by US booksellers, the message of this book is set to spread around the world. Michael Parker is the Headmaster of Oxley College in Southern NSW. He received Arts and Law degrees from Sydney University and worked briefly in a corporate law firm before turning his attention to Education. He has a Masters Degree in teaching Philosophy to children and has written six textbooks in the areas of Legal Studies, Philosophy in Schools, and English. 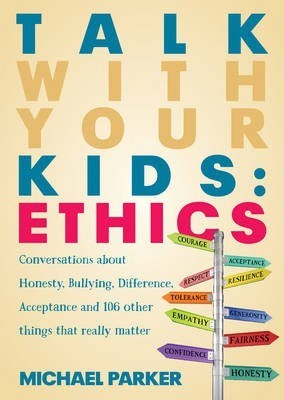 Michael joined the Jane Curry Publishing team in 2012 with Ethics 101: Conversations to have with your kids. A great success, the book has since been published in the USA in August 2013. The second book in this series, Talk With Your Kids: Big Ideas, was published in May 2014, along with a second edition of Ethics 101, aptly renamed Talk With Your Kids: Ethics. Michael's talents don't just lie in the world of Education publishing. He has had two novels published, including a Young Adult Novel Doppelganger, which was shortlisted for the NSW Premier's Award in 2007, and a children's picture book, You Are A Star, which was published with Bloomsbury in the USA in September 2012. He is married and has two daughters.